circle y barrel saddle 15”. Condition is Used. Shipped with USPS Parcel Select Ground. Circle Y Barrel Saddle. Connie Combs 14” saddle in good shape. Round skirt and semi quarter horse bars. Please message with questions. Comfortable even for trail riding- unfortunately doesn’t fit my new horse. 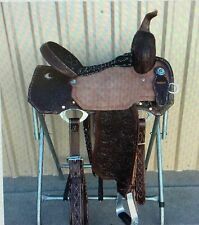 Gorgeous Kelly Kaminski Swift FLex2 Barrel Saddle in "Like New" condition. Tree Fit: Wide "KK Flex2 Barrel Wide". Saddle is in overall excellent condition and ready for a rider! Very nice 14" Circle Y! Nice, secure deep seat! Circle Y 14” Barrel Saddle . Condition is Used. Conch not attached but can be glued on. Royal blue customization. SemiQH tree/7” $900 Shipped with USPS Parcel Select Ground. 2017 Circle Y Just B Natural Barrel Saddle 15.5 hardly used. It’s a treeless with a medium fit which is meant for wider backs. Comfortable saddle and fits a wide variety of horses. Saddle will come with matching breast-plate. Makers: Circle Y Saddlery. Rigging Type: Inskirt. Type of Saddle: Barrel Racer. Saddle Maker Location: Yoakum, Texas. Box Basket With Buckstitch Border. Finished Seat Size: 14". Seat Type: Full Padded Suede. 3 year old 13 inch Martha joesey ultimate barrel saddle. In great condition. Only selling because I have grown out of it. Please call or text (870-904-5277) if interested. Circle Y 15” Barrel Saddle with Amethyst suede seat, rough out fenders, and a flashy white cantle. Gullet - 6 1/2” Semi-quarter horse bars Newer stirrups Stirrup leathers/billets in excellent condition Fleece underside in good condition except one spot at rear corner(see pics) Silver original except saddle corners, horn, and cantle piece. Replaced with matching flower theme (see last 3 photos). Beautiful flashy saddle, get noticed! This saddle is posted locally as well, auction may end early. Thanks! Barrel Racing Saddle. This smooth leather saddle is paired with a suede seat. Perfect for this spring's races! Finished Seat Size: 14.5". Tree Size: 15". Circle Y. Western Saddle. Connie Combs. Round skirt. Barrel Racing. Saddle was well used. Tear in leather under saddle (see photo). Horn leather is worn (see photo). The images we display have the most accurate color possible. Makers: High Horse by Circle Y Saddlery. Rigging Type: Inskirt C. Type of Saddle: Barrel Racer. Saddle Maker Location: Yoakum, Texas. Tree Construction: Precision High Horse Barrel. Finished Seat Size: 14". The Leona roughout barrel with Southwest border tool will make you take a second look – colorful double row stitching on skirts, seats, and seat quilt add a little “extra” to your run. Saddle Details Below. I DO HAVE MORE PHOTOS--JUST ASK! JUST STUNNING IN PERSON! YOU WILL NOT BE DISAPPOINTED! WEIGHS APPROX 27 LBS. (DD092618F). Cantle for a secure seat, and turquoise or hot pink rawhide braided horn with matching stitching for a unique look. Saddle Details Below. Tree- Precision High Horse Barrel. Seat/Bar- 14.5" Full Quarter Horse Bar 7". Swell- 12". Skirt- 24". Rigging Type: Inskirt. Type of Saddle: Barrel Racer. Saddle Maker Location: Yoakum, Texas. Makers: High Horse by Circle Y. Finished Seat Size: 15". Seat Type: Full Padded Suede. Tree Type (QH, Full, Semi): Wide Fit- Full. Barrel Racing Saddle. This saddle is complete with a suede seat and roughout seat jockey and fenders. Finished with floral tooling. Finished Seat Size: 13.5". Tree Size: 14". Martha Josie ultimate barrel saddle. Used a handful of times I am the second owner. Saddle is in great shape, need to sell because it does not fit my horse correctly. Pictures show seat and gullet size. Pictures are very clear on quality and shape of saddle. You are welcome to ask questions, there will be no refunds. Literally New with only 10 rides in it!!! 2019 assembled Martha Josey Ultimate Revolution barrel saddle by circle y. This saddle is the wide fit Flex 2 tree with a 14.5 in seat. This saddle fits just about everything. Saddle is priced way below value. Retails for 2620 Brand New. Model #6221. High Horse by Circle Y Mansfield Barrel Saddle. black roughout padded seat with hip hugger roll. 15 in seat. ralide wide tree. Makers: Circle Y Saddlery. Tree Construction: Treeless. Rigging Type: Inskirt. Type of Saddle: Barrel Racer. Saddle Maker Location: Yoakum, Texas. Fleece - Real or Synthetic: Synthetic. Seat Type: Full Padded Purple Suede. This isn't your typical Circle Y. Gorgeous deep tooling and real fleece. It looks like the saddle originally had an inskirt rigging, that has been replaced with D rings. 24.5" Skirt. Rich Mahogany color showcases the copper spot trim around the skirts and cantle. The antique copper cross conchos are gorgeous! The faux elephant seat is unique, sophisticated touch to create a classy look. Tree Construction: Treeless. Type of Saddle: Barrel Racer. Saddle Maker Location: Yoakum, Texas. Fleece - Real or Synthetic: Synthetic. Seat Type: Full Padded Suede. Makers: Circle Y Saddlery. Front Billet / Latigo: Nylon Latigo and Nylon Billet. Kelly Kaminski barrel saddles are designed to keep you in a balanced position. Each one is built with these key features: horn size and style allows you to lock your elbow into your hip around the barrels for consistent turns, and the groundseat and cantle design provide a secure, dished seat. Rigging Type: Inskirt. Type of Saddle: Barrel Racer. Saddle Maker Location: Yoakum, Texas. Maker: Circle Y. Finished Seat Size: 14". Seat Type: Full Padded Floral Suede. Weight: 27 lbs. Circle Y 14.5" Ocala Western Barrel Saddle #2166-T456-05 Full Quarter Horse Bar. Beautiful Buster Welch barrel saddle that is designed with the turquoise suede seat, conchos and turquoise painted border. Barrel saddle is great condition. Seat is in good condition no Tears. High Horse Jewel Barrel Saddle #6224 New 13" Regular Quarter Horse Bar. Who said you need to spend a small fortune on a great looking and – most important – great fitting barrel saddle?. The horse’s saddle fit is top priority. Tree Construction: Treeless. Rigging Type: Inskirt. Type of Saddle: Barrel Racer. Saddle Maker Location: Yoakum, Texas. Fleece - Real or Synthetic: Synthetic. Seat Type: Full Padded Purple Suede. Fleece lined neoprene skirts are flexible, molding to your horse's shape and bending with your horse in the turns. For the rider that likes a deep seat, the upright swell and cantle keep you secure and positioned.